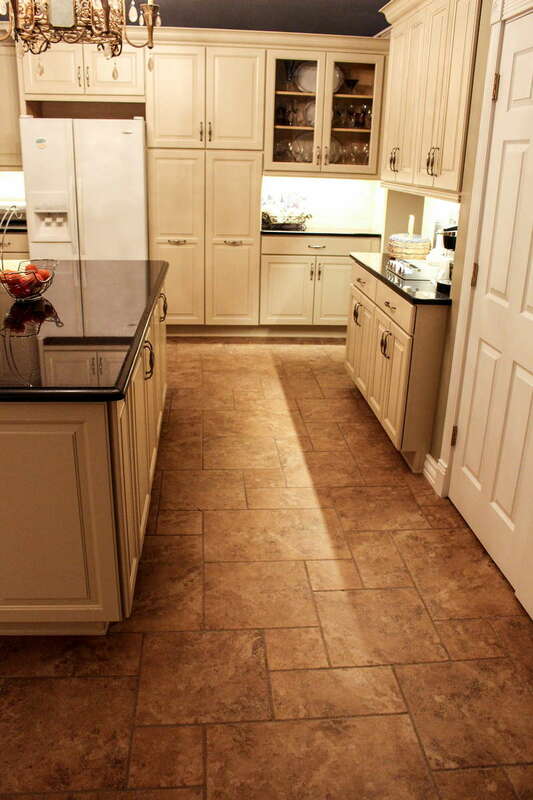 Our client’s project started with an outdated kitchen that needed a new look. The original cabinets were brown with formica countertops, all of this over a beige vinyl floor that was popping off because of a mold issue due to a roof leak. The client’s first concern was maintenance and durability, certainly after going through a mold remedy process it’s very understandable. 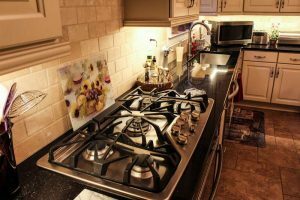 The project included all the aspects of a kitchen remodel, introducing porcelain tiles on the floor and granite dark countertops, and beautiful painted maple cabinets with lots of storage space. The French Pattern layout was created by combining different sizes in order to give a consistent pattern, that resembles an original Italian Villa floor. On the floor is Pietra d’Assisi in Noce color, a travertine look porcelain tile with chiseled edges set into a french pattern. Thanks to this type of pattern, the ranch home acquired a new elegant taste, a new Old-World look that will last forever with its classy personality. 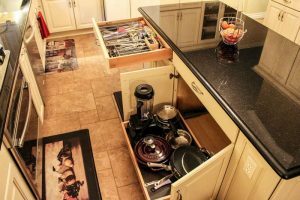 The cabinetry was designed ad hoc from our design center, to match each one of the client’s needs and wishes, thanks to the the semi-custom options that a great cabinetry company such as Welborn offers. Cabinetry is very important in the kitchen design, the door style has a nice detailed front with an elegant raised panel. This is all completed by a Slate color paint without any additional glaze, to let the details on the door express all their beauty naturally. Brushed nickel fixtures and cabinet hardware are a perfect match for the stainless steel appliances, as well as the antique bronze chandelier that overlooks the central island. 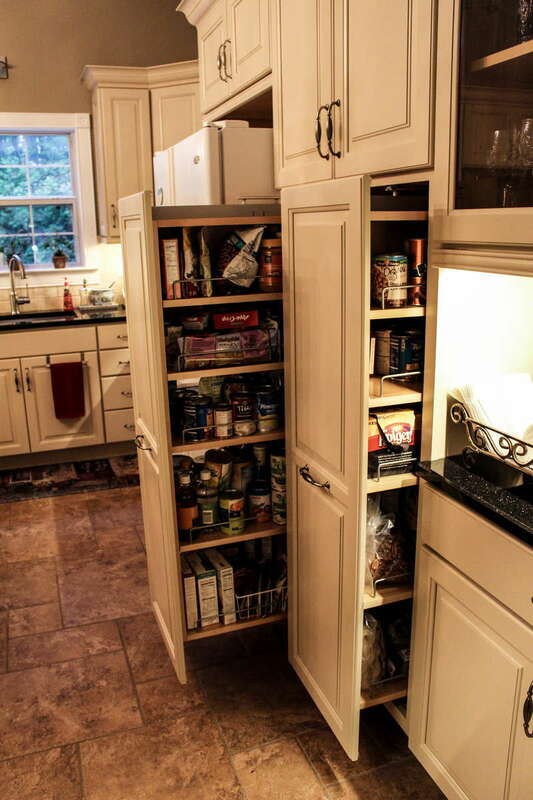 The pantry is a complete pull out cabinet, divided in 2 sections, that open separately and that can be accessed from either side. This allows the client to reach each individual item inside of her pantry without the need of bending, diggin in, stepping over a stool, or moving everything out to be able to get that one jar she is looking for. 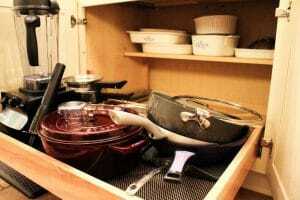 The upper side of the tower cabinet has a large shelf for storing those pots that she rarely uses. 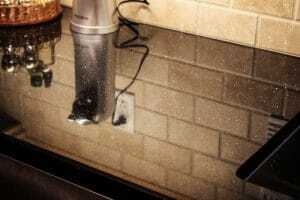 On the side of the fridge, a narrow door opens to reveal a pull out tray rack for baking sheets. 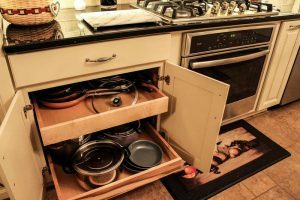 And right after that, a corner cabinet which includes 2 spinning and pull out shelves for allowing the use of every blind corners. Everything in the design is meant to help getting the most storage with the most comfort. Large and deep pull out drawers and shelves are the main guests of this kitchen! 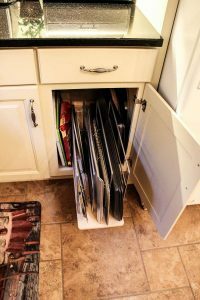 Thanks to these features, everything can be stored in the bottom and back of the base cabinets, without the need to bend over or crawl on the knees to get pots and pans. 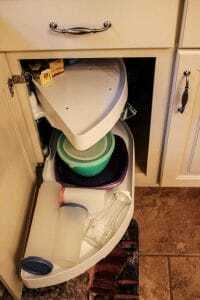 Maximizing the storage availability with the use of all the space. 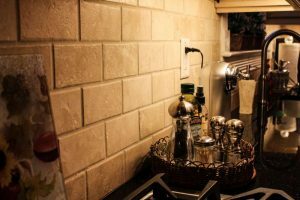 Travertine beveled subway tiles finish this kitchen dream remodel, and completes the design to a new renovated kitchen to love! Together with the Black Galaxy Granite countertops, these elements all combined are a piece of art inside the same room, a welcoming, cozy and sophisticated environment where to entertain any guest!